Today I feel like showing you my take on another beloved classic: the French Steak Tartare. This dish doesn’t require cooking, just a bit of fine chopping. The only compulsory step is for you to shop for the freshest ingredients since all you are going to eat is raw: that’s why I urge you to buy higher welfare meat (fresh and not matured) and organic eggs. This show-stopper dish really deserves your best efforts and a bit of love: the perfect cut would be fillet but it’s fine to use a more budget-friendly cut as surloin as long as it hasn’t fat or nerves. Concerning the tools I prefer cutting the meat with a knife, au couteau, but some use a meat grinder: in my opinion it risks to make your tartare a bit too mushy. And for all my vegetarian or non-raw-meat-eater friends I have a nice, twisted version of this French staple that you can check here. 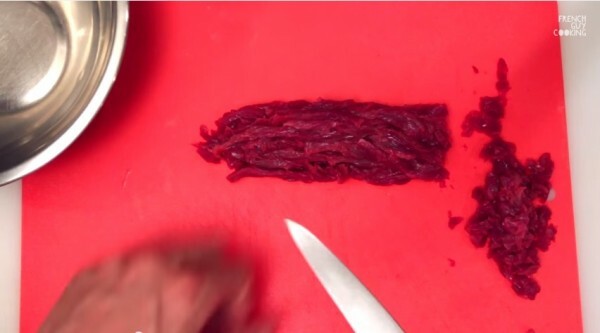 Cut your meat into very thin slices of meat, trimming off the eventual fat or nerves. Stack your strips and cut them into a very small dice. Place it in a bowl and drizzle lightly with vegetable oil. Chop three small pickled cucumbers and a shallot: try to replicate the same size of the meat dice. 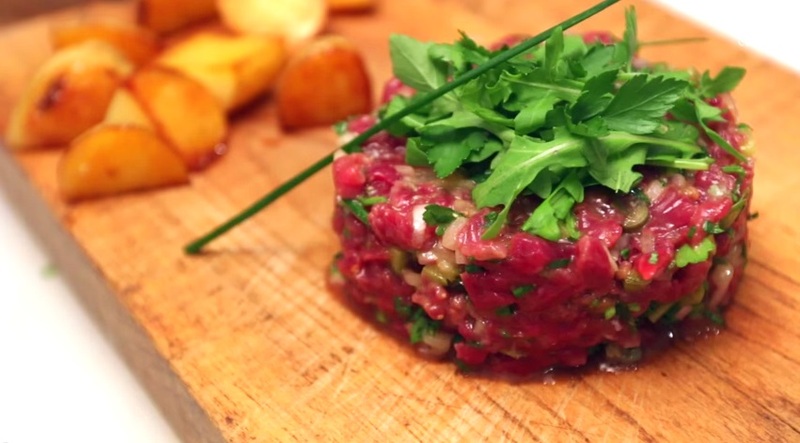 Chop as well a tablespoon of capers and a tablespoon worth each of fresh chives and parsley. 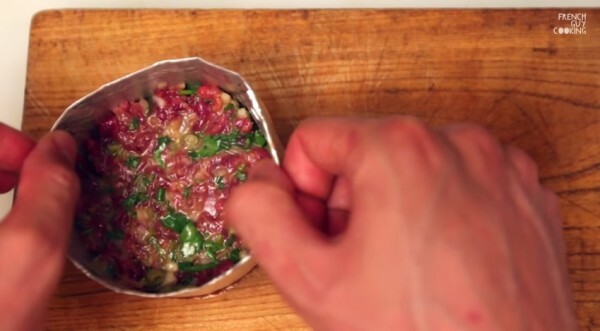 Add one very thinly siced anchovie for a boost of flavours. Add the egg yolk, the mustard, the ketchup, the Worchestershire sauce and season with salt, pepper and – if you like – chili sauce. Mix everything untill well combined. To serve the dish (remember: you can’t make it in advance, it must be prepared on the spot right before serving it) you might need a large cookie cutter or, if you don’t have one, you can make your own ring mould with tin foil. Place the meat in the ring and gently pat it down. 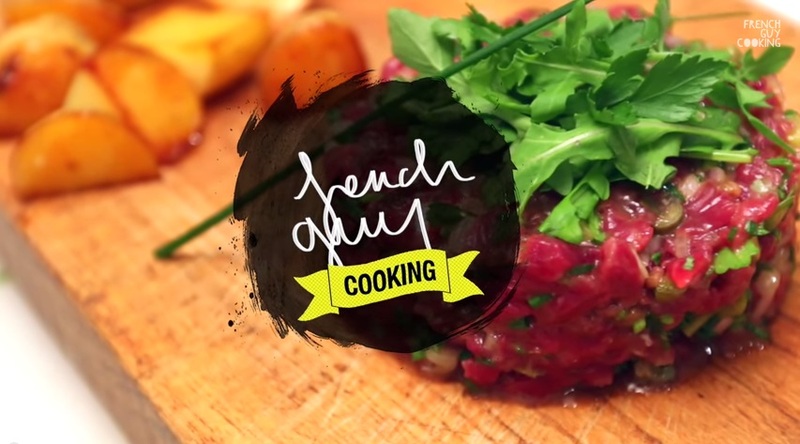 Serve with fresh chives and rocket on top with a side of roasted or french potatoes. 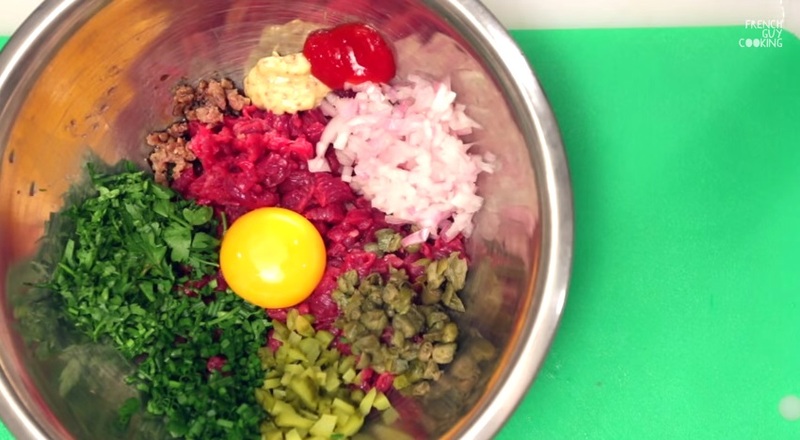 Best comments from You Tube on French Steak Tartare : Classic version + Vegetarian twist !